How you use water in your garden is very important to gardening success. Too much water and plants drown, too little water and they become stressed, and watering overhead with a sprinkler can cause disease and fungal problems and waste water through excess evaporation. The most efficient watering system for vegetable gardening is drip irrigation using drip tape. Drip irrigation solves many of the problems that incorrect watering methods can cause and delivers moisture directly to the root zone where it's needed most. Measure out length of main line hose needed to supply garden with irrigation. The hose needs to easily reach the main water source and run down the side of the garden beds. Allow some slack for hose to relax in the heat and contract in cooler weather. Attach regulator to filter using plumber's tape to make fitting secure and leak-proof. Turn until snug. Do not over-tighten or components will leak. Attach pressure regulator and filter to main water line, then attach to water source using plumber's tape to prevent leakage. The filter should be closest to the water source. 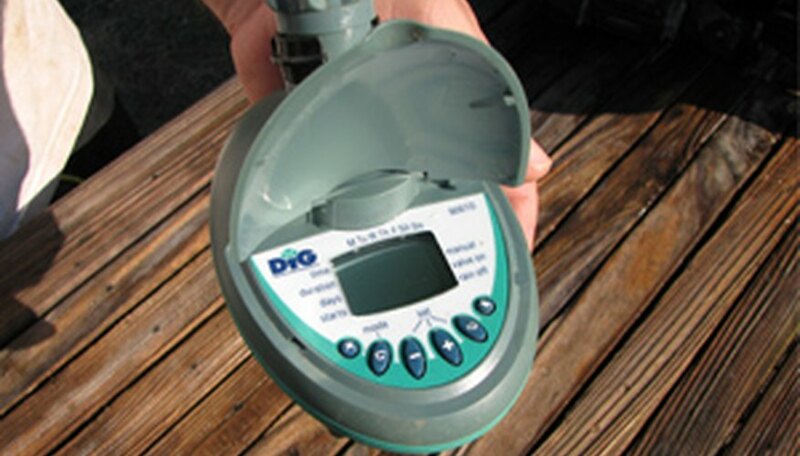 Most municipal water suppliers require a backflow preventer or anti-siphon device on all irrigation systems if not provided on outdoor faucets. If adding an anti-siphon device, the order of components from the water source is anti-siphon device, water filter, pressure regulator. Measure amount of irrigation tape needed for each bed. In average soil, add one row of irrigation tape for every foot the vegetable bed is wide. Sandy soil may need more tape placed closer together. Attach irrigation tape connectors to main hose by pushing them into holes created with a hole-punching device, then attach irrigation tape to connector. Position the drip tape so the water emitters face up instead of down where they can get clogged with fine soil particles or roots. Attach end clamp at end of each line of irrigation tape and main line. Covering irrigation tape and hoses with mulch prevents animals from chewing into tape and extends the life of the components. A regulator is important because high water pressure can cause connections to fail. It's better to water deeply once or twice a week to encourage deep root growth of plants. Empty system completely before a hard freeze.